DEADLINE FOR SUBMISSIONS EXTENDED TO 14 MAY 2018! Contemporary politics is characterised by a variety of participatory spaces within and outside state institutions. These spaces have been classified in various ways such as invited, claimed or closed. The study of democratic innovations is rich in empirical findings on invited spaces organised by state agencies all around the world, like mini publics, participatory budgets, and online petitions. Research on new social movements, citizens’ initiatives, and unconventional forms of participation like flash mobs, online protest, and hacktivism examines the nature of these diverse claimed spaces. And the study of parliamentary debates and deliberation in governmental institutions provides insights into closed spaces. The democratic scholarship of recent decades offers a great variety of theoretical and methodological approaches to capture the characteristics of these participatory spaces. Deliberative, agonistic, participatory, difference, and realist democrats apply competing conceptualisations of these phenomena. Recent developments in democratic theory raise the question whether such “model thinking” might be outdated and needs to be overcome. Are these different perspectives mutually exclusive or compatible? What are the implications of the world views that they imply? Do they offer useful perspectives or are they an obstacle for empirical research? Empirical work is characterised by the application of a diversity of methodological strategies that cut across quantitative and qualitative, positivist and constructivist traditions, raising the question of the most profitable approaches to studying participatory spaces. 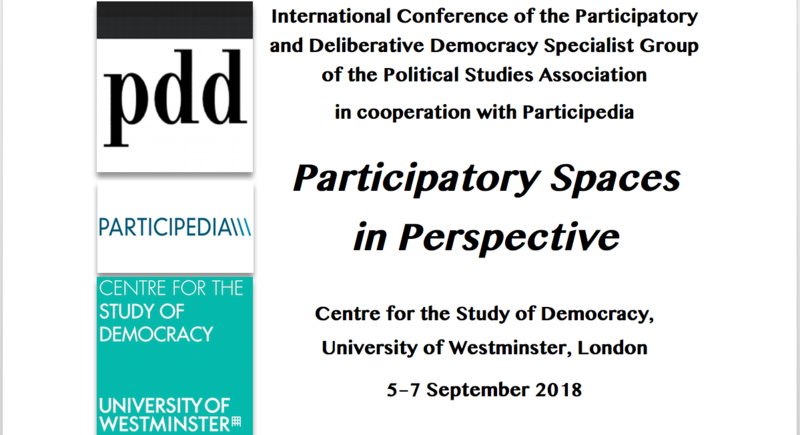 The Participatory and Deliberative Democracy Specialist Group of the Political Studies Association invites researchers on democratic participation and deliberation at all stages of their careers to discuss their empirical findings and theoretical conceptions of participatory spaces. The conference will provide a platform for exchange for international scholars in the field. Please send paper or panel proposals no later than 14 May 2018 (new, extended deadline) to psademocracy@gmail.com. Paper proposals should be limited to a maximum of 200 words and should specify their theoretical and/or empirical approach. Panel proposals should contain a short description of the panel and three to four paper abstracts. The application of early career researchers including PhD students is encouraged. Conference attendance is free of charge. Participants and their institutions need to cover expenses for travel and accommodation.